Moriarty must forge has way through a world without Sherlock. JUMPER), colors by Perry Freeze and letters and design by Dave Lanphear. “Even with characters that lead a pretty sad existence, there is a drive for something greater or at least a sense of discovery. It moves the piece along at a thrilling pace that respects, but expands upon Sir Arthur Canon Doyle’s fiction in a way that is thrilling and smart.”—The Daily Blam! 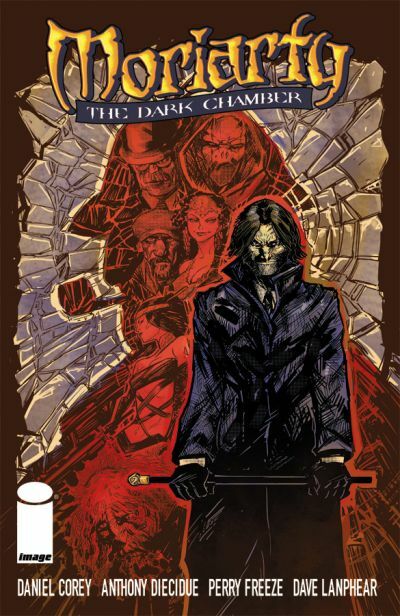 MORIARTY: THE DARK CHAMBER, VOL. 1 TP, a 128-page full-color paperback, will be on sale in stores September 14th for $14.99 and is available to order in the July 2011 edition of Diamond Previews (JUL110470, ISBN: 978-1-60706-450-3). For more information, please visit www.professorjamesmoriarty.com and www.facebook.com/daniel.corey.